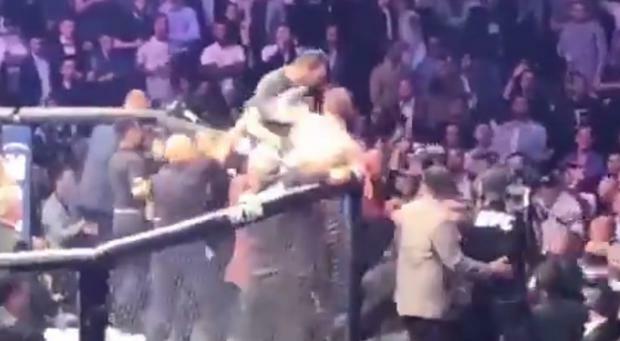 New footage of the aftermath of Conor McGregor's UFC 229 defeat to Khabib Nurmagomedov shows the Irishman striking a member of the Russian's team before he was attacked in the Octagon. McGregor's mixed martial arts return after a near two-year hiatus fell flat as he tapped out midway through the fourth round in Las Vegas, and Nurmagomedov soured a career-best performance with his actions immediately afterwards. Footage from a different angle show the 30-year-old Dubliner trying to jump out of the octagon and striking one of Nurmagomedov cornermen with a left hook as he was held by security staff. At 0:38 Conor McGregor sucker punches Khabib’s cornerman. I am told this was the primary reason Conor refused to press charges. He threw and landed the first physical blow in this melee. UFC president Dana White has said that McGregor would not be pressing charges against the three men arrested for attacking him. The Crumlin native later tweeted: "Good knock. Looking forward to the rematch."